This spacious 10ft x 10ft Tongue and Groove Cube Summerhouse is a bright and spacious garden building that is perfect for relaxing and enjoying the outdoors. 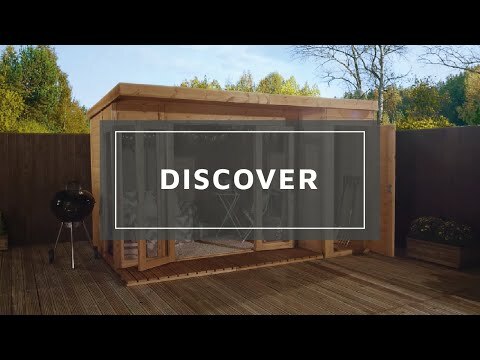 This modern summerhouse will add interest to the garden and will create a great focal feature. Six large windows and glazed bi-folding doors allow natural light to fill the interior and provide great views of your garden. The windows are glazed with 100% shatterproof styrene windows, a much safer alternative to traditional glass glazing. The concertina door is supplied with a lock and key to keep the garden building secure. The modern design features a pent roof and a covered veranda to the front and side of the building. The pent roof slopes gently towards the rear of the wooden summer house to prevent the build-up of rain water, protecting against weather damage. Heavy duty green mineral felt is supplied to provide extra protection from wood rot. Made from ethically sourced timber, the walls, roof and floor are constructed using 12mm tongue and groove cladding. The interlocking design forms a strong, robust build which also prevents water ingress. Complete with a ten year anti rot guarantee, you can be confident that this garden building is hard wearing and built to last. Review:Good quality summerhouse for the money. Thank you for your brilliant review on our Great Value for Money Summerhouse. Review:NOT APPLICABLE - Summerhouse is lying in bits on the drive, with the men's muddy footprints on it.